Cerise straps on her space gear and travels to a vibrant unknown universe. There’s something relaxing about playing a sandbox game with no real sense of time passing. My experience with other sandbox exploration and crafting games can usually get pretty intense. Like many, I get completely engrossed in the mining and crafting loop to the point where I’ll spend time away from the game thinking about what I’ll do when I next open it. That loop can truly feel addictive, and while I do find that a lot of fun, it can be pretty stressful too. 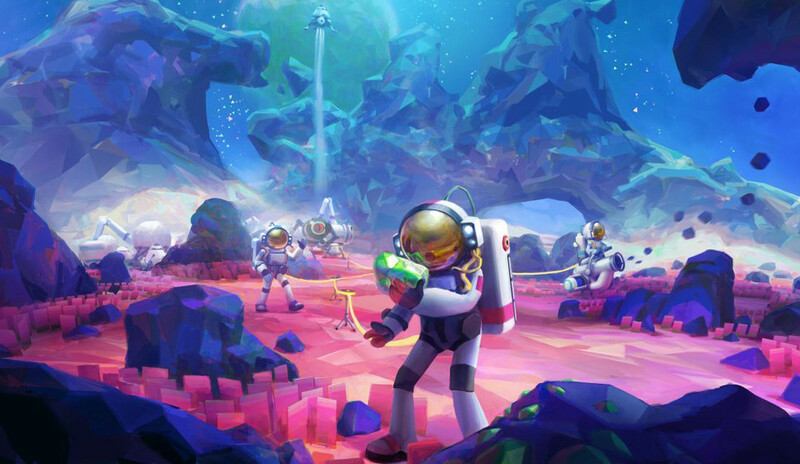 While other crafting games might lead me on with an obsessive desire to complete “just one more” task, Astroneer gives you room to breathe. Here the players take control of an adorable astronaut and guide them through a charming sandbox adventure about colonising planets. The colour palettes remind me of the sunsets you see in cheesy postcards, and at times I do feel like I’m simply on holiday setting up camp. 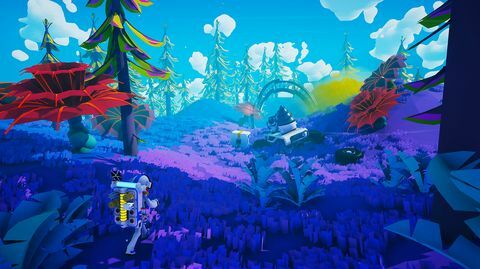 As you explore you find colourful forests and mountains, and space debris scattered throughout which hint that you may not be the first to come here. In the tutorial, you’re taught the basics: how to stay connected to oxygen, how to mine for important material, and how to use your backpack’s 3D printer to make bigger 3D printers that print bigger things, and so on. You’re also taught how to sculpt the terrain for when you need a bridge or a staircase, which is one of the main ways a player can solve problems in the game. The sculpting is tricky to use but it’s relatively freeform, and you can sculpt whatever you like, or at least try to anyway. Searching through screenshots online I’ve seen people create some pretty cool things, including a giant statue of their own astronaut. There’s no deadline or immediate danger early on looming over as you play, no real sense of time passing, and no money to hoard, and although there are plenty of resources to collect, I didn’t really feel like I needed to hoard them. For me, this change of pace was both refreshing and alienating. Each session was fun and would leave me feeling like I accomplished something small, but I also never felt an urgent need to go back to it. There just wasn’t anything motivating me. Still, this makes for a very relaxing and friendly multiplayer mode, which is easily the game’s main strength. 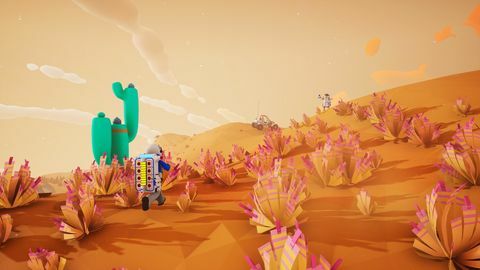 Astroneer's multiplayer shines in how it allows players to do their own thing if they choose, but also encourages friendly problem solving and teamwork. I had spent some time creating long webs of oxygen tethers and marking key mining sites before I invited a friend to play. When they joined, they were happy running off and exploring what I had already seen while I worked on setting up more of the base. We ran around separately, to begin with, and then once that was out of our system we banded together for a cave exploration mission. I’m pretty sure if there was a safety code in space, our mines would get an excellent rating. This is where I found an extremely specific passion. My friend would jump straight into the caves chaotically dropping tethers behind them, and I would follow while carefully carving a safe pathway for our eventual ascent. I’d spend time carving a dip into the paths so a person couldn’t easily fall off the side, then smooth them out so they were easy to climb back up again on the way back. I’m pretty sure if there was a safety code in space, our mines would get an excellent rating. This also meant my friend could scope the mine out as I set everything up, and by the time I was done they would be able to guide me through to where the goods were. This worked really well for us, and it turned out that part of the fun was finding a good way of working together. 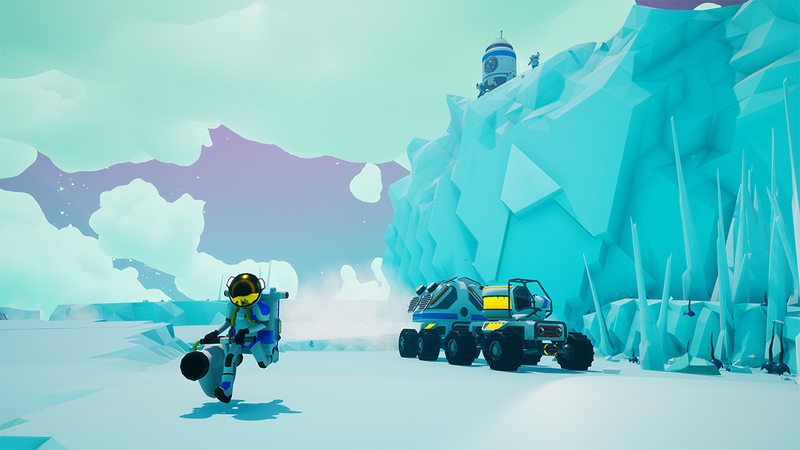 Astroneer has been perfect as a light game to play with friends. The relaxing pace means you can take time to chat with each other, and work things out as a group. Unfortunately for me, that wasn’t quite enough to draw me back in. I’m sure there’s plenty left in this game to discover, but I just don’t seem to have the patience necessary to grind through the repetitive gameplay in the hope that I might see a little more variety. In saying that, if you’re looking for something a little more gentle to unwind to, this may be exactly what you’re looking for. 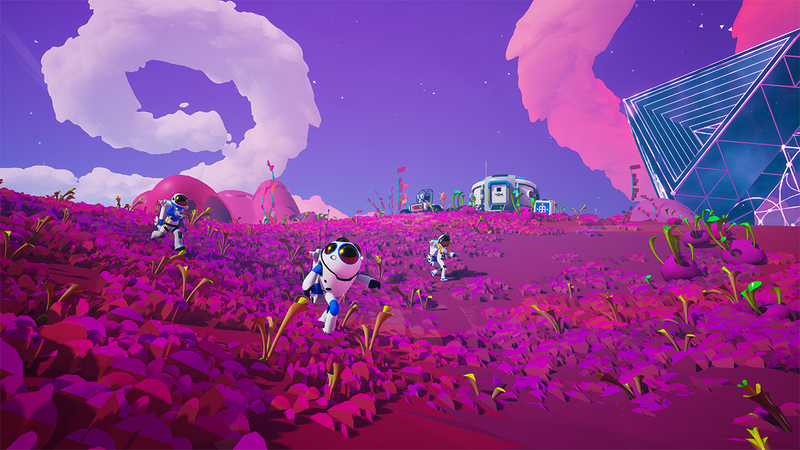 Astroneer provides a (mostly) tranquil environment to explore with your friends, or by yourself to unwind. 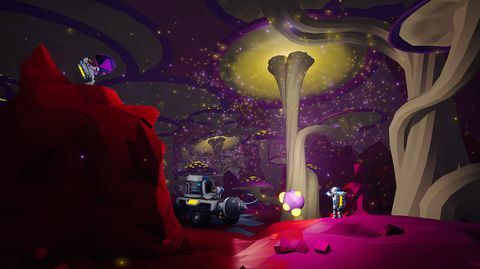 The fact that the game doesn’t bury you in a collection loop and actually gives you breathing room to explore and tinker will be a downside for some, but for those with the patience, it’s a game you could easily spend hundreds of hours unraveling. Ups Approachable cute art style. Slow pace mixed with lots to discover means the game will have a long lifespan for aspiring space explorers. Great for playing with friends. Felt like I had only seen the tip of the iceberg. Downs Nothing about it is especially motivating to get you back in, playing solo can feel a little too slow.